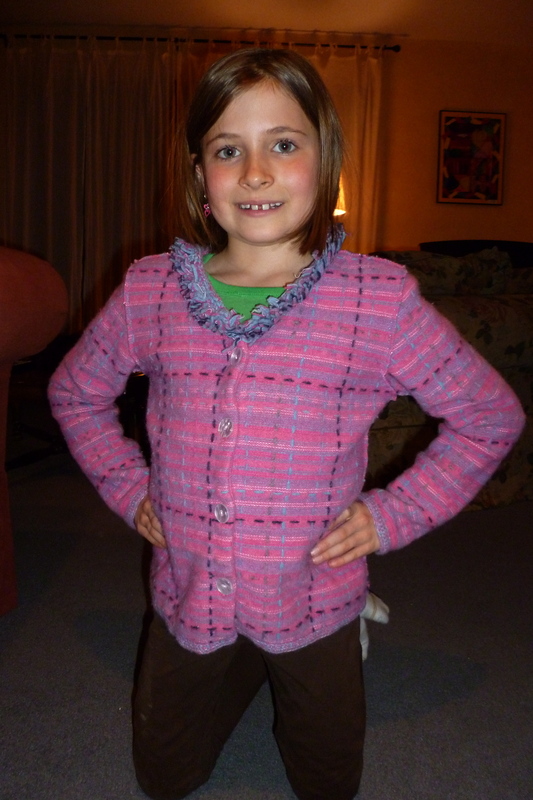 One of my winter projects was to upcycle a sweater which I purchased from the local second-hand shop. It was a rather boxy size medium Sigrid Olsen women’s sweater with the neckline trim made of crochet and cut loops of yarn. 1. Remove the neckline trim and crocheted bottom edge and the buttons. 2. Felt the sweater in the washer and machine dry until you have the desired amount of felting. The result was not only a sweater of a smaller size but one that was incredibly soft. 3. Cut the sweater pieces apart at the seams. 4. 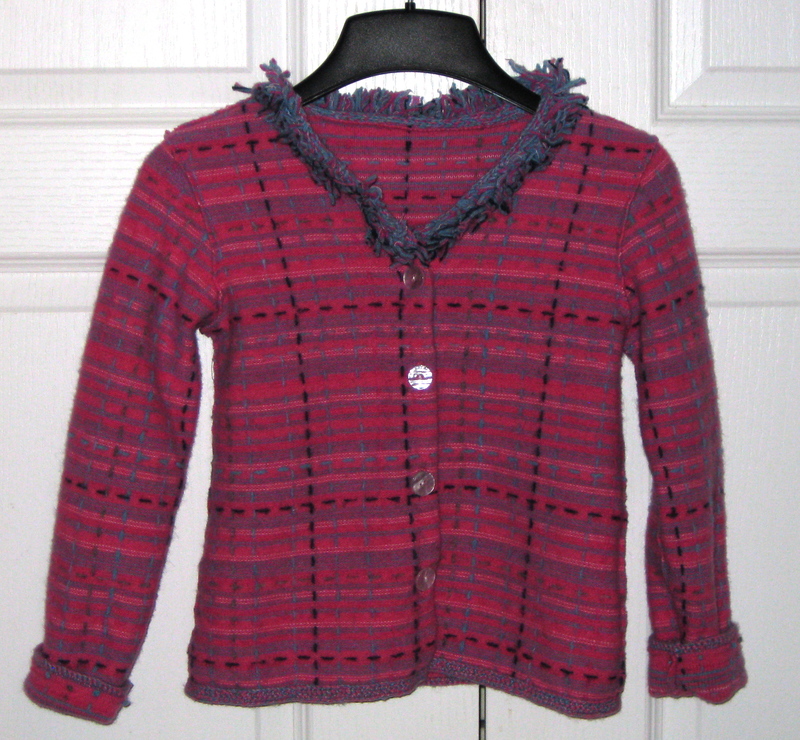 Re-cut using a child’s sweater or sweatshirt pattern. Keep the front overlap intact so you can use the buttonholes and finishing. In this case there was barely enough fabric to cut a size 7 sweater. 5. 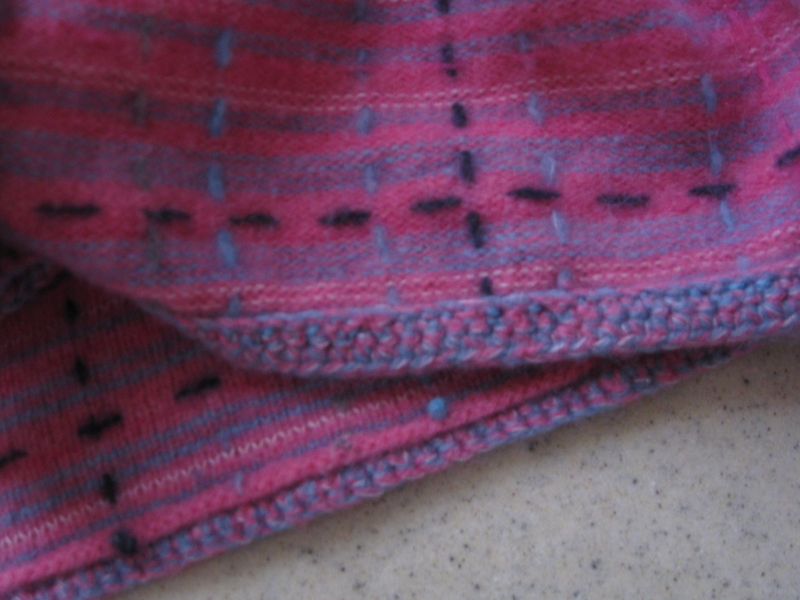 Sew the pieces together by laying one seam over the other (probably a 1/2″ overlap), using a backstitch. This results in a nice flat seam which is amazingly strong. It takes several hours of sewing time in front of a good movie. 6. 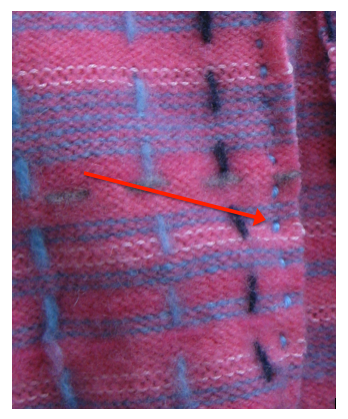 Re-attach the neckline trim and the braid at the bottom both with a backstitch. On our last visit to Wisconsin, I gave Mira the sweater. 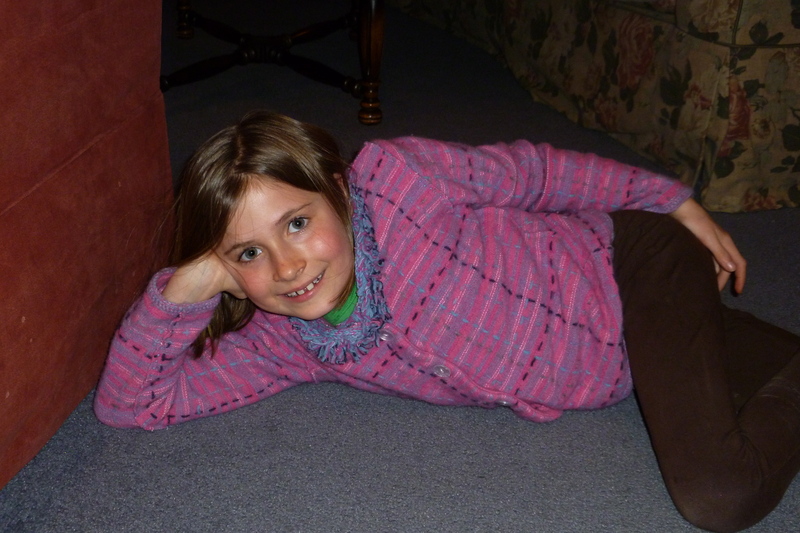 She loved the softness and named it “Steve the Sweater”, in place of her favorite plush bedtime partner, Steve the Fish. He was mysteriously missing so Steve the Sweater became her replacement sleeping partner. So this blog post is for you, Mira. Felted wool has always been somewhat of a fascination for me, whether it comes by way of recycled/upcycled sweaters or if purchased already felted. Several weeks ago I listened to Anne K’s Greenstitch podcast where she talked about how she learned to recycle wool sweaters, felt and transformed them into holiday gifts – great advice and inspiration. 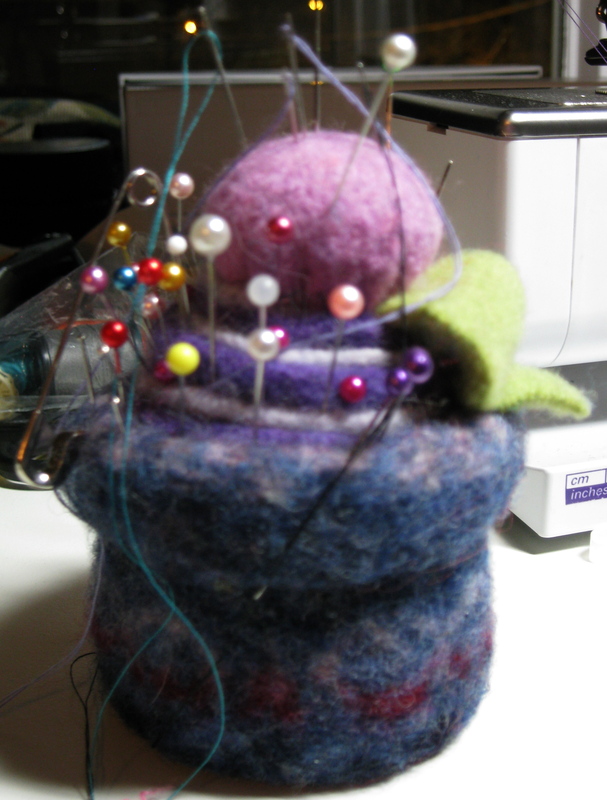 Then I found this creative recycled wool pincushion at a knitting store. Clever – and it works well. Oh yes, before the holidays I made a felted grey wool knit dress that I love. One of these days I’ll catch a photo and post it. Then today, wouldn’t you know, Kenneth King’s felted sweater tutorial was pushed from Threads Magazine. You get the picture – felted and felting wool has been occupying some small part of my brain. Post-retirement, I keep wondering what will take up space in my brain currently being occupied by all things work. Guess this is part of the answer. All of the above and the fact that I need to de-stash before we move later this year, caused me to think about the bins of felted wool in my basement. Several years ago I purchased dozens of wool sweaters of various types and styles to learn how to felt. 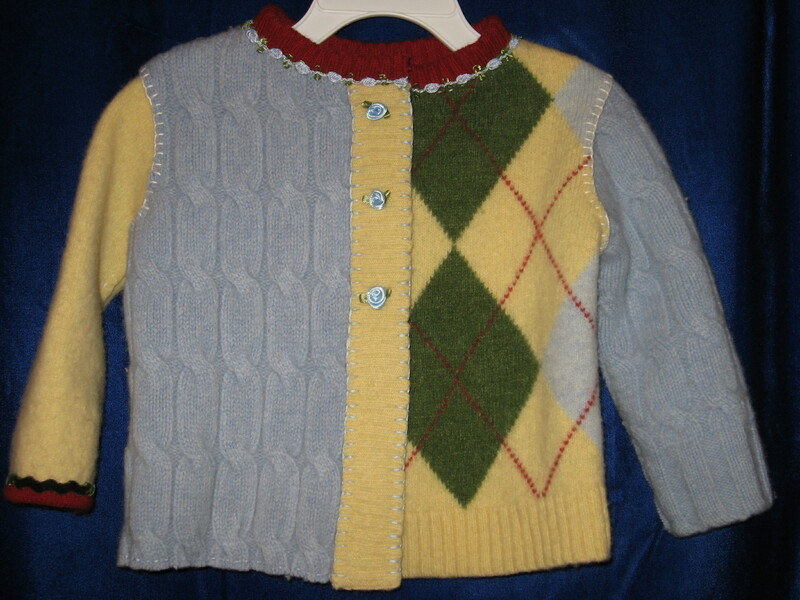 My intent was to re-cut the pieces and hand-sew infant or children’s sweaters – all warm a cozy. It was fun to learn how the different wools were transformed into felt. I learned what doesn’t felt well (cables, fisherman knits, heavy knits and worsted weight). Also learned what felts well – my favorite is cashmere or lightweight merino. I did make about 8 or 10 toddler sweaters; sold a few on Etsy, a few to friends and family and a few extra have taken up residence in my sewing area. Then I moved the wool to the basement and there it stayed, awaiting the talents and creativity of someone I’d not yet met. After pulling the bins from the stash, I sorted, folded and posted on Etsy. Within a day, nearly all of it sold and I mailed it off this past weekend. I can’t wait to see what the buyer creates. What are your experiences felting wool?